It is a three-month long celebration of brightness and sunlight. From May to July, the summer months in Russia see a surfeit of arts, theatre and revelry. Ballets, operas and some priceless masterpieces are performed much to the delight of art connoisseurs and culture keepers. 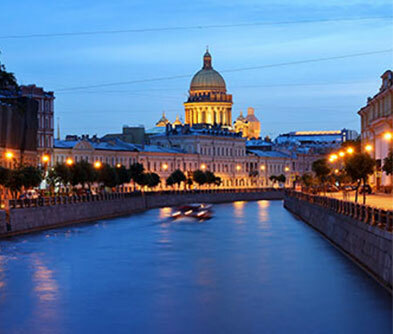 Alternatively, experience White Nights Fest on the streets. Period plays with creative costumes, gypsy music, hypnotic drumbeats, street moves and romantic tête-á-têtes are all yours to savour. 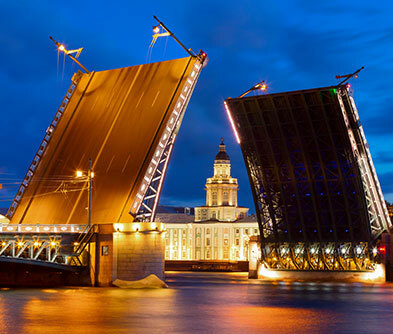 Watch in wonder as the bridge heaves open across the Neva, raise a toast with Sovetskoye Shampanskoye or Soviet Champagne, head to the famed bar ‘The Idiot’, for gourmet meals and exotic wine. Take your fill of Vodka, indulge in some native specialities like Lobio, a thick red bean soup, Khachapuri Tarkhunit, a cheesy herbed bread or enjoy spicy meatballs called Abkhazura. 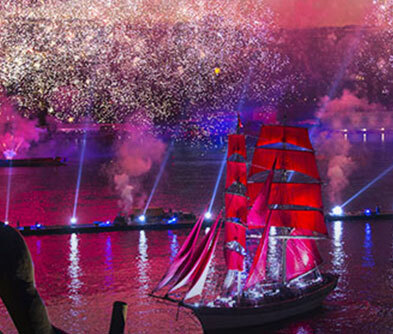 The celebration culminates with the grand event of the Scarlet Sails. As fireworks decorate the sky, the Scarlet Sails float along the Neva signalling the culmination of yet another school year. The glee of thousands of children adds to the festive spirit. Streaks of peach, violet, crimson and pink render the white sky ornate. And a general feeling of cheer and joy envelops the city.